Are there more legends coming to DC’s Legends of Tomorrow? Last weekend, DC Comics announced three new character additions to the new CW superhero series. 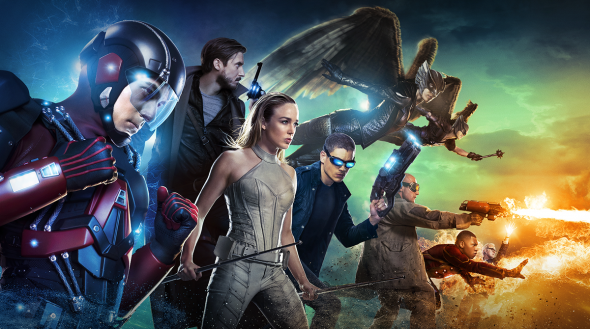 DC’s Legends of Tomorrow premiered on January 21st. On their Instagram page, DC Comics announced three classic DC characters would be joining the Legends of Tomorrow crew later this year. The characters include one of first female superheroes, Red Tornardo, Golden Age superhero Hourman, and the original Sandman. All three characters first appeared in DC Comics in the 1930s and ’40s, so perhaps Legends of Tomorrow is headed back in history. Tough to tell at this point. The CW has yet to announce when the new characters will be appearing, but it will be sometime later this year. The armor may be DIY, but this guy is no pushover–come to think of it, he's not a guy at all. So who's under that pot…? Screenshot this image and use filters to reveal the answer, and share your findings with #LoTEasterEggs! @cw_legendsoftomorrow: Thursday at 8/7c on The CW. With this hourglass, its pharmaceutically empowered owner can peer into the near future. Screenshot this image and use filters to reveal the answer, and share your findings with #LoTEasterEggs! @cw_legendsoftomorrow: Thursday at 8/7c on The CW. Criminals beware–this mystery man goes against the grain, and he won't hesitate to put you to sleep before you strike. Screenshot this image and use filters to reveal the answer, and share your findings with #LoTEasterEggs! @cw_legendsoftomorrow: Thursday at 8/7c on The CW. What do you think? Are you watching DC’s Legends of Tomorrow? What do you think of the new character additions? Do you know who the other two new characters are? Looks like most of the original JSA will be in this. Love DC legends I watch Flash and Arrow now this just love them all.